the stuff in the box tastes like congealed, watered-down kool-aid. There is no actual fruit involved, just artificial color and flavor. But, it is so easy and fun to create a fresh fruit version. There is really nothing better, and more summery, than the taste of fresh strawberries. 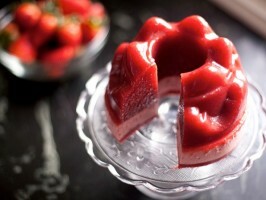 Take those gorgeous strawberries, puree them and add just enough gelatin to set the fruit in a fancy mold. Knowing how to work with unflavored gelatin properly means you can set a liquid, without having it bounce like a rubber ball. You want to use just enough to keep its shape, but still have a smooth, luscious feel.